Book Description: Introduction to Sociology adheres to the scope and sequence of a typical introductory sociology course. In addition to comprehensive coverage of core concepts, foundational scholars, and emerging theories, we have incorporated section reviews with engaging questions, discussions that help students apply the sociological imagination, and features that draw learners into the discipline in meaningful ways. Although this text can be modified and reorganized to suit your needs, the standard version is organized so that topics are introduced conceptually, with relevant, everyday experiences. For the student, this book is based on the teaching and research experience of numerous sociologists. In today’s global socially networked world, the topic of Sociology is more relevant than ever before. We hope that through this book, students will learn how simple, everyday human actions and interactions can change the world. In this book, you will find applications of Sociology concepts that are relevant, current, and balanced. Sociological Research: Highlights specific current and relevant research studies. Sociology in the Real World: Ties chapter content to student life and discusses sociology in terms of the everyday. Big Picture: Features present sociological concepts at a national or international level. Case Study: Describes real-life people whose experiences relate to chapter content. Social Policy and Debate: Discusses political issues that relate to chapter content. Key Terms are bold and are followed by a definition in context. Definitions of key terms are also listed in the Key Terms, which appears at the end of each chapter. Further Research: This feature helps students further explore the section topic and offers related research topics that could be explored. 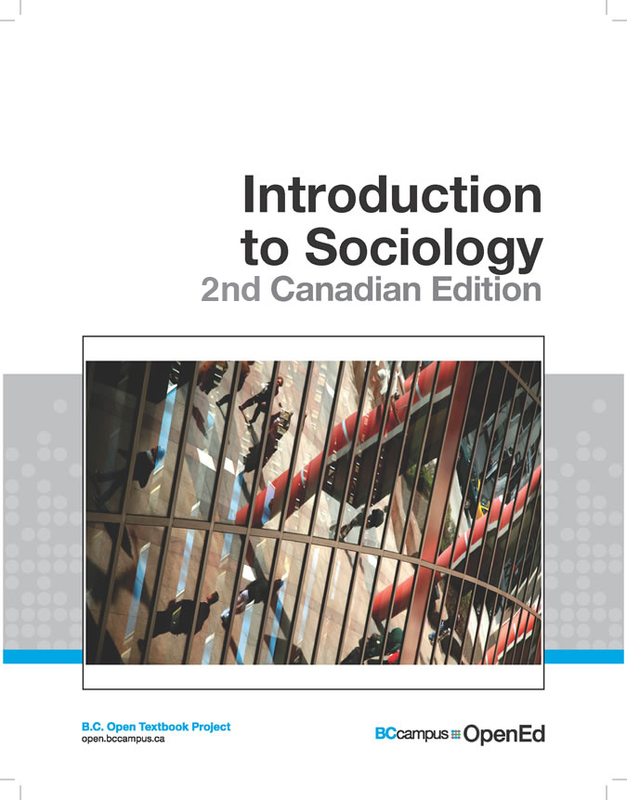 Introduction to Sociology - 2nd Canadian Edition by William Little is licensed under a Creative Commons Attribution 4.0 International License, except where otherwise noted. Unless otherwise noted, Introduction to Sociology is © 2013 Rice University. The textbook content was produced by OpenStax College and is licensed under a Creative Commons Attribution 3.0 Unported License, except for the following changes and additions, which are © 2016 William Little, and are licensed under a Creative Commons Attribution 4.0 International License . Changes to this book, as a whole, were made to achieve the following goals. Replace U.S.-centric content with Canadian content. This included examples, case studies, significant figures, perspectives and, more pragmatically, spelling, idioms, measurements and grammatical structure and style. Add feminist theory and feminist perspectives throughout the text. Add Canadian aboriginal perspectives and content. Key Terms, Section Summary, Quiz, Further Research, and References in each chapter have been updated to reflect new chapter content. For a detailed list of the changes and additions made to this book, see “2nd Canadian Edition Changes”. Cover image: Inverted Reflections by Senor Codo used under a CC-BY-SA 3.0 license .